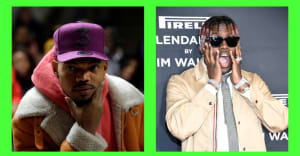 Chance dropped by the BBC to play seasonal faves from Kanye, The Jackson 5, and more. "Christmas is my favorite time of the year," says Chance the Rapper, opening up a new mix and interview on the BBC with Huw Stephens. Chance dropped by the show to play some of his seasonally appropriate favorites from Kanye West, Donny Hathaway, DJ Rashad, and of course, Jackson 5. The interview also functions as a nice 2016 recap, with Chance speaking on what he calls a "heart-heavy" year, but also revisiting some personal highlights, including recording a song in Muhammad Ali's memory and his burgeoning friendship with the President. Listen to the show below via the BBC.